It’s often forgotten. In fact, I constantly have to remind myself that it was even a theatrical sequel. Disney seems to regurgitate material so often on the direct-to-video market, it’s easy to get confused. But there’s a reason this went to theaters – it’s actually quite good, even better, perhaps, than the original. (I know that last point is debatable, so have at me if you must!) Bernard and Bianca, the trusty mice from the Rescue Aid Society that saved the little orphan girl in the first film, are back. This time they’re out to recover a kidnapped Australian boy who’s fallen into the clutches of the evil, if a little dunderheaded, McLeach. 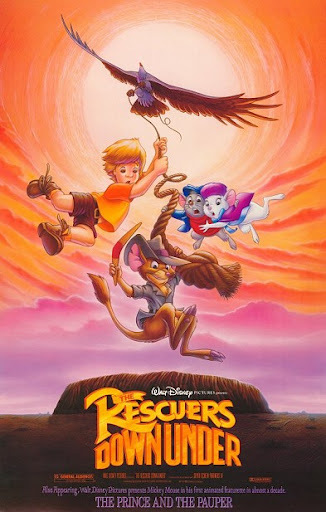 What really works in this movie (aside from the stellar opening credits – that sweep over the Outback is fantastic, and the music from Bruce Broughton never ceases to excite me for what’s to come) is its action/adventure premise served up so nicely you sometimes forget we’re dealing with talking animals. What the pop culture-referential talking animals of today’s CGI-laden market have lost is that true storytelling spirit. The movie is actually compelling and doesn’t need slapstick to sustain itself (though the always entertaining John Candy provides great comic relief as Wilbur the albatross). Add to all this some wonderful voice work from Eva Gabor and Bob Newhart as the titular mice heroes and a devious George C. Scott as the intimidating villain, and the movie’s got it made. And can we talk about how majestic hand-drawn animation can look? Check out any landscape scenes in this movie here to find your proof.